If I’m reading this calendar right then today is Tuesday and here in the Gutter that can mean only one thing. It must be time to review a Joe Clifford novel. No, not that one; the other one. Most people would be content just to sit back and take the plaudits after reaching such a literary high, but Joe Clifford isn't most people. His introduction to Zelmer Pulp's Hey That Robot Ate My Baby! may be viewed by many as his finest work to date, but hold the phone, he has another novel out. Wake The Undertaker is actually Joe Clifford’s first novel. It beat the much-admired Junkie Love to the punch by a couple of weeks. When that autobiographical crowd pleaser showed up fashionably late with huffing candy around its nose and a sly grin on its face, it immediately set about stealing the thunder from its elder sibling and has been hogging the limelight ever since. While there is little doubt that Junkie Love is a damn fine book, Wake The Undertaker is no ugly sister and it’s high time we showed it some love. Nineteen year old Collie Spector is a nightclub singer on the up. He’s got the looks and the voice, but he’s also got the boss’s girl, Zoey, and when that boss is Gabriel Christos, the son of Bay City’s crime overlord Cephalus “the Old Man” Christos, it doesn’t take a genius to work out that the fall Collie is headed for is going to be a big one. Gabriel orders a beat down, which includes ending Collie’s career by cutting his vocal chords, and with the help of Bay City’s crooked cops, Gabriel frames the singer for a crime he didn’t commit. Collie does time in the City’s Island prison of Rockville, working on his upper body and trying to come to terms with the fact he will never sing again. When he comes out, he is twice the man he was, but Collie isn’t the only one who has changed during those seven years. Gabriel is now estranged from his old man and trouble is brewing between them. Collie soon finds himself sucked into their murky underworld of drugs and politics and ends up working for the very man who orchestrated his downfall. If you were to cut Wake the Undertaker with a knife it would probably jump up and shank you with a rusty screwdriver, but first it would bleed noir. And I don’t mean any of that Johnny-come-lately noir, with hipster protagonists who moisturize and drink white wine spritzers. This is pure old school gold, where hoods date strippers and bent cops are on the take from nightclub-owning crime bosses. Here, the washed up newspaper men tell it like it is, everyone drinks their bourbon straight and nothing is quite as it seems. The semi-fictional setting of Bay City is a dark and moody rendering of Joe's San Francisco. These storm washed streets and fog bound shoelines give the book a rich and atmospheric feel, similar to that found in Frank Miller's Basin City—only with a lot more more rain. This is such a tightly written novel, everything is on point and the story never makes a slip. The intricacies of the plot and the skill of its delivery reminded me of Ellroy at the top of his game, and for me, it doesn’t get much better than that. 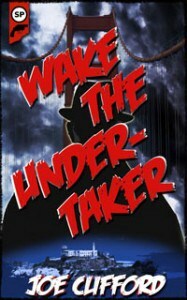 I really hope that Wake The Undertaker isn’t destined to become Joe Clifford’s “other novel." It deserves much better than second billing and is a true star in its own right. Part of me hates Mr. Clifford for being this good, but most of me can’t wait to read his next one.